Need your Starbuck's fix, but don't have the cash? Go ahead and use mobile developer Jonathan Stark's card. No, really. Stark has posted details of his Starbucks card online, and is allowing anybody to use it. 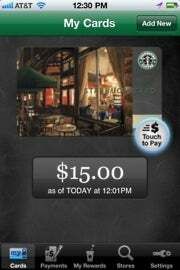 A screenshot capture of his card in the Starbucks iOS app is available from his website, and anyone can download this and save to their phone. The image will work just like it would if it was the actual app at any Starbucks register, Stark has discovered. The idea for the communal Starbucks Card came after Stark stumbled on the fact that an image of the digital card works exactly like the app. See, here's the deal: in an effort to stave off fraud, Starbucks only allows customers to associate a Starbucks card with one mobile phone (at a time). Stark, however, being a mobile developer, often uses more than one phone. Stark has since discovered that a screenshot of the iOS app works just like the app itself. "The ramifications of this sorta blew my mind. I mean, I had just paid for physical goods with a digital photo," Stark said in a blog post. This is good news for you, because now Stark is opening up his card for everyone to use. It's not all philanthropy, though--he also wants to learn how people will share physical goods digitally. Stark is encouraging users to deposit money in the account when the balance gets low. I've watched the balance fluctuate through a Twitter account set up to track the experiment. It's been an interesting ride, and guess what--the balance has been as high as $185. It kind of reminds me of a digital version of the "pay-it-forward" you hear about happening at Starbucks drive-thrus from time to time. Some people will mooch of course, but there are quite a few good-natured folks out there. How does Starbucks feel about this? The company fully supports it, believe it or not. "We think Jonathan's project is really interesting and are flattered he chose Starbucks for his social experiment," spokesperson Gina Woods told PCWorld. I am pretty excited to see the results of this. But for now--if you'll excuse me--I'm going to go get my daily Starbucks fix.